The Lib Tech La Nina MC is a very different board. Lib Tech calls this C1 which makes the La Nina is kind of like a BTX board in the front and then a C2 BTX board in the back. It’s really hard to characterize this board when you compare it to other hybrid shapes. Some are tapered and some have a similar shape with directional rocker but none have a ride like this. The 2015 and 2016 Lib Tech La Nina MC changed up the sizing and eliminated the smaller and larger sizes but it’s still the same ride. Not much has changed with the 2014 La Nina MC vs. The 2013 La Nina MC with the exceptions of a few minor tweaks. It’s still a good but weirdly unique double ender freeride/all mountain/All Mountain Freestyle really hard to define kind of board. Conditions: about 1/2 foot of powder one day and some harder snow with a little light snow on top on another and the most recent day there was over 1 foot of powder. Set Up– Set back a bit, approximately 23 inches wide, 15 front and -9 back. The Lib Tech La Nina MC was designed by someone who rides in a place that gets a ton of snow like Baker. It’s worse season on record is 500? and it’s best is 1,200? so if you compare that to anywhere else in the US it’s just plain nuts when it comes to powder. This is designed for the rider that wants to ride a double ender type of board but still want’s good directional float in the deep thick snow many on the West Coast encounter. 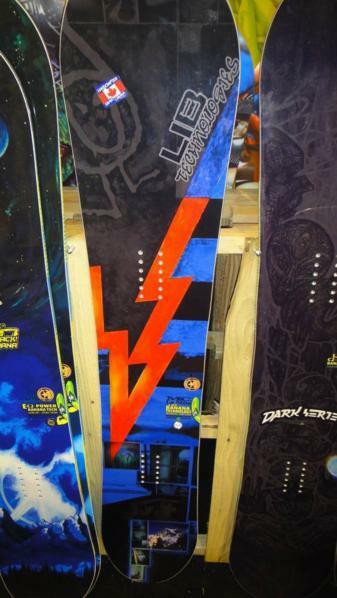 On Snow Feel– It’s really hard to classify who would like this and what riding style this board should live in. It’s catch-free and pretty loose for a freeride board so you can butter around but it also comes in bigger powder friendly sizes. 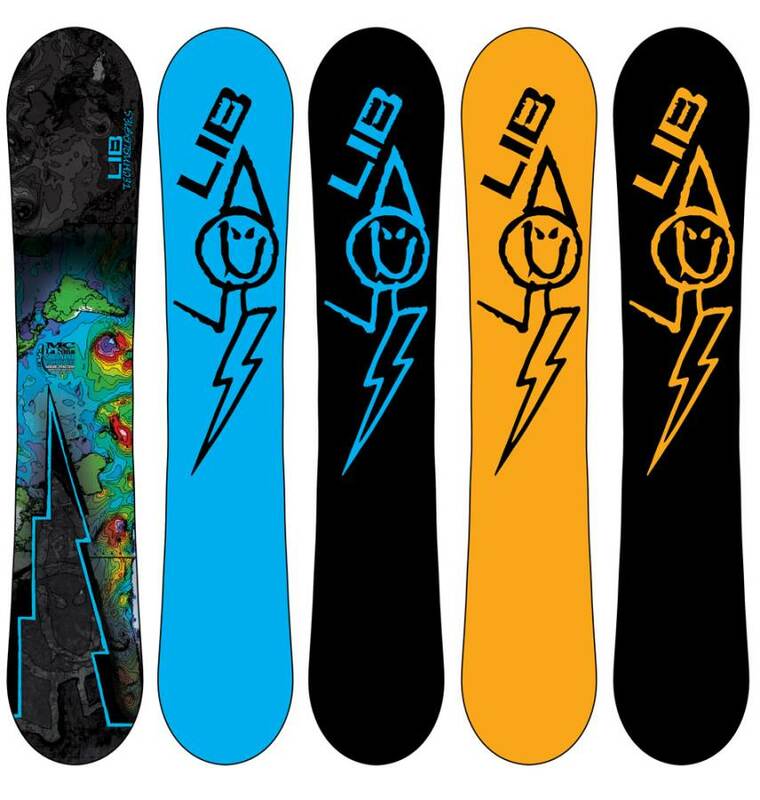 The Lib Tech La Nina MC is pretty stable between the feet but in the harder snow, it does get looser. Its a board designed for the directional rider than always wants to float in pow but wants a more playful easy turning ride compared to boards like the Lando Phoenix. Powder: It’s tough to say if this will be excellent for everyone but it will be excellent for most. Some live for a tapered directional board and others love a directional board with directional rocker to get them off when it’s deep. Still this will float in just about anything and is better for the rider who wants to ride in one direction in the deep stuff. You can ride switch in the powder but this is made to ride way set back. The camber in the back made it fun to pop off a little lip but also still made it easy to lean back with very little rear leg burn because it’s still rockered up. I liked this a little better than the boards with true camber in the back. It’s a little surfy but also has kind of a directional skate like feel that is pretty unique and fun. Turn Initiation and Carving– The C1 shape makes the La Nina a more fun board to turn regular instead of switch. It’s incredibly easy to transition from edge to edge. Even though an advanced to expert rider would appreciate this board the best a beginner to intermediate freerider would be able to learn on this board if they wanted to fork out the cash. When it came to carving it was fun to lay into a turn and lean back into the tail. It was pretty easy to stay into a carve until you were going back uphill. Very fun here as long as you don’t ride switch. Speed: This is pretty stable for a hybrid rocker board but it still feels more comfortable staying on edge than flat basing in harder to icy conditions. You don’t really have to worry about that because the rider who gets this board will be more interested in powder or riding in good conditions than hard pack and might never find this quality out. Uneven Terrain: Nice and easy in crappy bumpy tracked out resort snow. Its design has pretty good shock absorption between the feet. Weight– This is like all Lib Tech boards. Not too heavy and not to light. It’s always right in the middle. Edge Hold: The La Nina has a mellow MTX side cut similar to the Jamie Lynn and we really liked this. It seems just slightly more aggressive between the feet and had a little more grip. It held an edge well where ever we were and at the same time wasn’t ultra grippy in softer snow which is a common complaint amongst the more aggressive lib tech MTX boards. Flex: The La Nina doesn’t feel as stiff as the flex rating but it’s still no soft park board. It’s not ultra friendly when buttering around but you can still bend the board past the natural rocker points. Switch: It’s a very different riding switch but you can get used to it. This is a set back directional board with different rocker in the nose than the tail so you should expect this. Still, it’s ok for riding switch on a traverse to good powder or the occasional switch landing of a natural hit. Jibbing- Not that great in the park. It’s pretty big and uneven when it comes to sliding around on a technical rail. Still, it’s a Lib board and they make sure just about any board can go anywhere. You can stop at the park on your way back to the gondola if you want to. Pipe: The edge hold is there and this board is forgiving but I can think of so many boards out there that would be better for riding the pipe. Jumps: As you can see from the other Park categories that this won’t be ideal in the roller coaster park but it will be really fun for a method off of a natural hit. The little bit of camber in the tail made it an easier time to generate your own air when riding so set back. 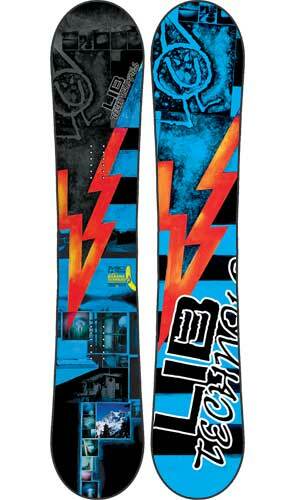 All in all, this was a very fun board and had that signature Lib Tech Rocker/hybrid rocker feel. I would say it felt more like a C2 BTX board but with a little powder extra. This is a great powder+ board and it won’t slack off too much if you have to ride when there isn’t powder. All in all this is a great mostly mountain to powder snowboard. If you aren’t into the loose ride that many directional hybrid rocker boards offer there are other hybrid camber boards that will accomplish about the same ride and offer a more stability between the feet. It’s all personal preference so if you like the loose feel that hybrid rocker offers this is a great board. Well done Lib Tech. We try to get as many images of the Lib Tech La Nina MC, but forgive us if they're not all there. Baker is my local hill, this board is made for riding on fresh snow days. It kills powder and does a decent job riding hard pack on the way to a pow stash and that's why I own it. Yes there are other great powder boards but this is fun in the afternoon when the AM pow is mostly tracked out but there are lots of little stashes left, however you have to ride some tracked out stuff to get there so why not have some fun on they way. It is perfect for me and what it's designed for, thus a 5 star rating.